With these short stories, Hatim Kanaaneh explores the changing, precarious, and ever-shrinking world of Palestinians living in Israel. As his village’s first Western-trained physician, Kanaaneh had intimate access to his neighbor’s lives, and he chronicles them here in a fictionalized collection of vignettes. His cunningly crafted stories reveal the struggles, triumphs, memories, and hopes of the indigenous Palestinian community living in a state that neither acknowledges their past nor supports their future. Following a diagnostic scheme used by physicians worldwide, each story is titled with the “chief complaint” of its protagonist. Taken together, the stories poignantly convey the indigenous Palestinian community’s foundational chief complaint: its conflicted relationship with the state of Israel. Dr. Hatim Kanaaneh was raised in the Palestinian village of Arrabeh. After earning his medical degrees at Harvard University, he returned home to head the region's governmental health office and served as the only area physician. He helped establish The Galilee Society, an NGO addressing the health needs of the rural population. 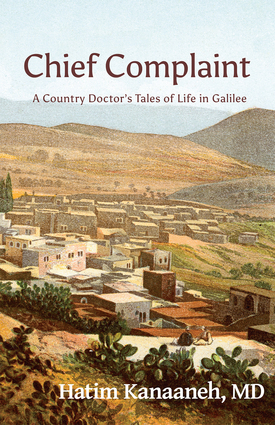 Kanaaneh documented those efforts in an earlier book, A Doctor in Galilee: The Life and Struggle of a Palestinian in Israel (Pluto Press, 2008). Chief Complaint is his first work of fiction.